When I hear the traditional rhyme 'in a dark, dark wood', my thoughts automatically turn to Janet and Allan Ahlberg's children's book series Funnybones, which always used to begin with a variation of that rhyme. Where the Funnybones books were full of fun and weren't at all scary, Ruth Ware's In a Dark, Dark Wood, which is introduced with the same traditional rhyme on its first page, is tense, full of suspense and shot through with a healthy dose of scariness. Nora hasn't seen former best friend Clare in 10 years, so it's a surprise when she gets an invite to Clare's hen do. Reluctantly, Nora decides to go, and soon wishes she hadn't, when it's clear that the hen weekend is the woods is going to go very, very wrong. I went into this book with a fairly strong dislike of hen dos (enforced fun, ugh) and came out of it never wanting to go to another one (sorry any friends of mine planning to get married). And that was before the actual thriller stuff happened. Ware is really good at creating a tension-filled atmosphere in which a disparate group of people come together and have to spend time getting along and being on top of their game. Nora doesn't want to be there for reasons not clear right at the start, while school friend Nina clearly thinks the weekend is a waste of time. Melanie is spending the first weekend away from her six-month-old baby, while Tom is from a part of Clare's life the others can't really relate too. And Flo, well, Flo is that hen do organiser who wants everything to go perfectly. Times a hundred. She's the most interesting of the secondary characters, with her fierce love of Clare, her desperate need to belong, and her wild mood swings. And while she's transparent in some ways, she's also unreadable in others - her desire to be liked hints at deep insecurities, yet she can actually be incredibly courageous and gung ho at times. I think Ware's portrayal of Flo, a person who clearly has a mental illness, is layered and sophisticated, and avoids stereotypes. If the hen do itself and the collection of clashing personalities isn't enough to give you nightmares, just wait. Ware's setting - a glass house in the middle of a wood - is creepy from the beginning, and as things start going wrong the tension level builds and builds. What's really clever is the way that there's almost a dual narrative, which makes it harder to work out what has happened. We start the story well past the middle, go back to the beginning, and then eventually meet up with where we started about three quarters of the way through, at which point the book almost becomes a traditional whodunnit. Almost, because Ware is a lot cleverer than that. The novel's characters aren't sure what has happened, adding to their fear and uncertainty, and it took me a while to solve the crime. I had suspicions from pretty early on about whodunnit, but not who they dunnit to, which is a lovely twist. Once I'd got things properly worked out, it was then a matter of seeing whether or not the characters would solve the mystery, and I spent a lot of time towards the end holding my breath and feeling my heart pound a little faster because of the coming danger. Ware wraps it up with a great take on the traditional scene where the detective gathers all the suspects in the room to tell them how the crime was committed and whodunnit. We get a truly frightening encounter, and I wasn't sure who would come out of it alive, if anyone. 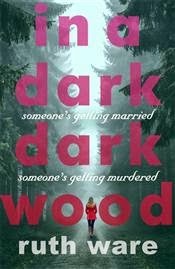 In a Dark, Dark Wood is a thrilling, pacy novel full of clever turns, layered characters and a setting that will set your teeth on edge from the start. There are no funny bones here, just deadly serious, heart stopping ones. •In A Dark, Dark Wood is released in the UK on July 30, 2015. How I got this book: From the publisher, Harvill Secker. This did not affect my review.